How are you? I am kind of stressed, as my most important exams are coming soon, and I will have to study a lot. Don't worry, I will still have a time to do my weekly recap, as it sort of relaxes me. So wanna read another recap? Here we go! This week was kinda 'weird' with releases. We got one update on Wednesday, and 3 on Friday! Okay, so I am not a big fan of animal print, which is the main theme for the collection. There are some other nice pieces. Let me mention few: Brown jeans - ex hotbuy, and another pair of jeans to add to my collection, as I did not want to pay high prices for those in bazaar. Yeah, I adore jeans. Next, black bag with spikes, which you were able to get before only by playing some Stardoll game, Fashion.Inc, if I'm right. And of course, the infamous colorful eyelashes, ex hotbuy as well, and quite popular. I've been really hoping to see them re-released as I love them, so thank you, Callie!! 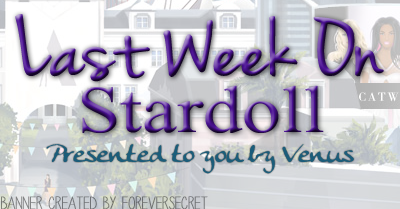 On Friday, we first got a new offer by Stardoll. We haven't had any of those recently, so it is a nice idea. Basically, you were able to obtain the bag by making a purchase on Stardoll, either by topping up the stardollars, or purchasing a superstar membership. The bag is kinda unusual, and I love it. Still, it wasn't enough to influence me to extend my membership. Glad that the offers are back, and I hope I see any that might make me prolong my membership, but again, stupid exams.. The same day, we got new Velvet Orchid clothing collection. Not a big fan of the collection overall, though there may be 2 or 3 pieces that are 'okay'. I loved the very 1st collection, when the store was named differently. (I am not sure exactly how the store was called before, Evening Falls I think, am I right?) Like I sad, it's a no from me. And we finally got to see the following month's hotbuys will look like. On Stardoll, I'm a huge fan of long dresses as well. That's why I can't wait to buy the one on the spoiler. It is gorgeous, sparkly, elegant. I also love the heels and earrings, sneakers are cool too, other - nothing special. I like how they used one of new hairstyles on a photo, instead of teasing us with hairstyles we will never get. So the week was okay, and there are some spoilers about the things we can expect next week. I am talking about new PPQ collection, (I love those collections), Chanel Tribute decor, and some random freebies I guess. Hope you loved my post, and see you next week. By then, leave a comment and vote on the poll. Thanks.